Chris Paul’s foundation is helping his hometown HBCU, Winston-Salem State raise money for scholarships and uniforms. Chris Paul has never been shy about his connection to HBCUs, especially this NBA season. The Houston Rockets guard has decided to join forces with his hometown HBCU, Winston-Salem State, to help it raise money for its student-athletes. The Chris Paul Family Foundation has joined WSSU on its “Team 250 Challenge” as it seeks to raise $250k to pay for scholarships and uniforms. “Our family is honored to support student-athletes at WInston-Salem State University. We challenge all alumni, friends, businesses and corporations to join the team,” the foundation said in a statement. A decade removed from an attempt at moving to Division I, WSSU is trying to stay afloat in Division II. WSSU recently announced it would be ending its baseball program, one of the more successful programs in HBCU baseball, following this season due to funding. The school has also had to absorb the cost of new uniforms as Russell’s withdrawal from the uniform business has forced the school to purchase new uniforms for Under Armour. Paul attended college in Winston-Salem, but at Wake Forest University. This isn’t the first time he’s helped raise money for the school. 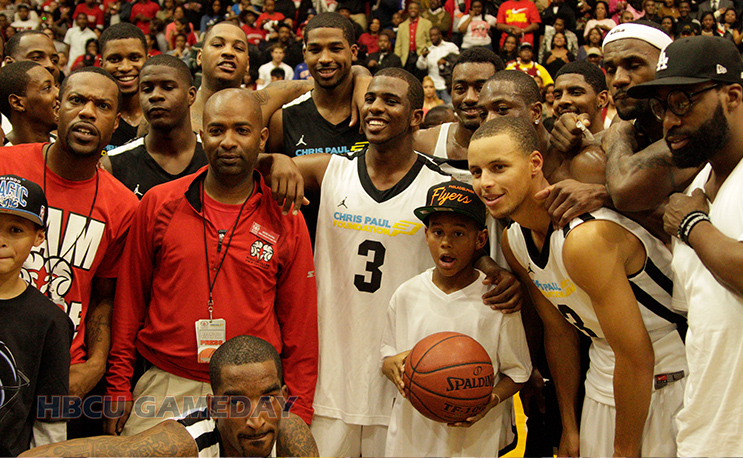 He put together a charity all-star game during the 2011 NBA lockout and held the game in WSSU’s C.E. Gaines Center. He’s been a particularly vocal HBCU advocate this year, from his clothes to his speech. He’s worn gear from several HBCUs, including Texas Southern, Tuskegee University and North Carolina Central, as well as WSSU. Earlier this week he spoke about his support for HBCUs and how important they have been to him and his family. Once again, CP3 is doing it for the culture.